Angela Merkel promised on repeated occasions during her election campaign that reform of Germany's energy transition plan – Energiewende – would be high on her agenda if she received another mandate to govern. Following her triumphal re-election and the political horsetrading on forming a Grand Coalition with the SDP and the Greens, this reform will have to come. For German industry, and private consumers the sole numbers that count are the unit price per kWh or kiloWatthour on their bills – which have spiraled to some of the highest in Europe, to fund the plan. Eurostat gives a 2012 average for electricity prices for smaller consumers of 11.9 euro cents per kWh across the Union, but German prices can double, or triple that at “bad times” of the day, week, month and year when the wind isn't blowing and the sun isn't shining. To be sure electricity can be free, sometimes, but this has little or no trickle through to consumers' bills because of electricity trader juggling of prices, domestic regional and international power block quantity transfers, power transport costs, charges and overhead, and other factors. Average prices have risen, and the EU average for electricity prices, about 25% less than the German average is already bad news for the European economy. Prices are far above average power prices in the US, China, Russia, India, Australia, and elsewhere. Even worse for Germans, prices were set to increase even more unless Energiewende is reformed. Industry associations and lobby groups, such as the Eurogas lobby have constantly underlined how far out of line German power prices were drifting, due to Energiewende. For Eurogas' vice-chairman J-F Cirelli, the deadly combination of a collapse in European ETS carbon emissions prices, caused by over-issuing credits, and very high prices for natural gas in Europe due to “holier than thou” refusal to allow shale gas fracking, has resulted in low emission, recently built, high capital cost gas-fired power plants becoming non-performing assets – a problem that is especially acute in Germany. Among its four “legacy power producers”, E.On has been especially hard-hit by investing in new gas-fired plants. Not rocking the boat and preserving the status quo are two key reasons Merkel is so popular. High electricity prices go the other way – especially as autumn and then winter comes along. Germany's creaky power transport system – needing urgent big ticket investment whether or not Energiewende is reformed – is now a risk, not a national asset. Power breakdowns and large-area blackouts are most certainly possible. Grid investment is surely high on the Merkel Energiewende reform agenda. Merkel's uber-political decision in 2011 to reverse her previous outspoken support for nuclear power, and push through radical and total abandonment of nuclear power by 2021, won her significant cross-party support, in the wake of the Fukushima disaster. But her belief that Energiewende could ramp-up in a smooth, hands-off, trouble-free process and solve all problems of electricity supply and its costs did not stand the test of time. As I noted in several recent articles on Energiewende, the plan has “grown like topsy” creating its own logic, but is not God-given, has reached the end of its best-before date, and is above all amenable to reform. This means diluting targets and pushing forward the dates for achieving key levels of renewable energy in the energy mix. Why Germany should obtain about 85% of its electricity by around 2045 from renewable energy – and not 2055 – cannot be easily defended. Much more important, the energy pricing system and process needs urgent reform. Merkel has already made clear allusions and references to the feed-in tariff (FIT) power pricing system designed to give an advantage to renewable power. This system began more than 13 years ago, and like Energiewende has “grown like topsy” to become a byzantine porkbarrel system for subsidy hand-outs. At its beginnings, the FIT system was set in a political and economic context where it was taken as sure and certain the big four “legacy power producers” E.On, RWE, Vattenfall, EnBW would maintain the dominance they wielded ever since Federal Germany was created in the 1950s. This did not happen. By 2012 only about 5.5% of all renewable-source power is generated by these “oligopoly producers”. The reasons are as much financial as technological, ideological as well as economic. The Big 4 are basically not able (or willing) to either develop renewable-source power at the rates demanded by Energiewende, or shoulder the costs of power transport grid investment, which for EnBW is a major part of its business. Conversely the real world shift of the German power industry from the Big 4, to a large and increasing range of smaller producers and distributors – and the municipal stadtwerke energy and water companies which enjoy high confidence among the public – transformed this industry. Hailed as the largest-ever peacetime democratization of a major industry in the developed countries, over little more than 15 years, this creates as many headaches as opportunities for Merkel. FIT subsidies need to be shifted from aid to “downstream” power producers and distributors, to “upstream” renewable energy equipment producers – who now badly need support. This of course will further erode financing support to power grid investment development at an acutely sensitive moment. Merkel however has plenty of options – including the bank sector reform she must also urgently start. Reform, here, can easily include banks being “leaned on” to invest in power transport through special purpose vehicles and funds, in return for Federal financial support to their pressing need for restructuring, increase of capital, and reining-in of bad loans. Certainly able to get approval from the Greens and SDP, Merkel can also work with Germany's stadtwerke on the now-pressing problem of national, versus local and regional power system investment and development. The stadtwerke, in several key industrial regions, are well-placed to cooperate with local major German industrial groups for rapidly solving the growing problem of “power starved regions”, and companies. Merkel can also make a political gesture, at EU level, on the thorny and deadlocked issue of saving, or trying to save the European ETS carbon credits system. ETS is somewhat like Energiewende – it grew out of all proportions and lost contact with reality, but in the case of ETS it has already collapsed. Reform of ETS to also include environment, development and social goals – finally replacing CO2 emissions as the sole criteria – has become a frequent side-theme at EU Council of Ministers' meetings. Merkel can take a high ground role for “saving ETS” through reforming its criteria and bases, applying her new model of ETS, in Germany, as a pioneer. 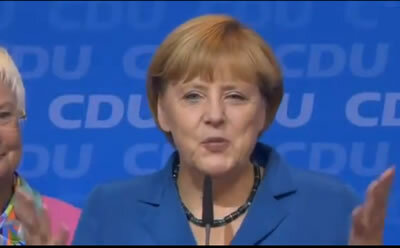 Her new combined FIT-ETS reform, depending on the pace she wants to apply it, would surely include an initial and major reform of how the FIT are set, presently an overgrown jungle of opaque decisional layers well suited to the long-dead East Germany Merkel hails from. She may or may not have the political courage to decide that FITs could be whittled down to a very small power number of power price bands, while industrial subsidies to renewable energy equipment producers are increased in return for a heavily-needed curtailment of ambitions and goals among German “silicon valley hopefuls”, who in fact will never beat the Chinese. Overcapacity in the industry has to be cut back, but the industry should not be dumped in the trashcan of history. As Merkel knows very well, the industry has been a technological and industrial triumph and an economic and financial disaster. Major reforms are needed. Energiewene was and still is set in a policy framework we can call “paranoid”. Germany must become totally self-sufficient for energy – while overseas buyers of Mercedes or Audi saloon cars must remain totally dependent on German car exports. This underlines the highest-level reform Merkel needs to apply to Energiewende – the levels of self sufficiency for energy supply that the reformed plan should target, by date in the future. As we know, in reality and in fact, Energiewende only concerns electricity supply. In the European Union, few countries exceed a 25% share for electricity in their total final energy consumption. Germany is well below this at around 21%. This leaves the other 75% - 79% of total energy to be supplied. As we also know, the primary energy utilised in each country almost always has a heavy proportion taken and used to produce secondary electricity. From this ultra-simple analysis able to convince a physical chemist like Mrs Merkel, de-electrification is a very rational policy for the energy-economy. Energiewende goes the exact opposite way. Notions of defending the Homeland, “uber alles”, through becoming energy self-sufficient, only for electricity and at extreme high cost, ignore the very basic trading and economic relations Germany has. This includes hydrocarbons exporters such as Russia, which continues to treat its dependence on Mercedes and Audi car imports as a non-critical political or economic challenge. Russia has no fixed, set date to become totally self-sufficient for home-produced luxury saloon cars although it is certain it could do so – if it threw as much money at the the problem as Energiewende does in Germany. Finally therefore Merkel's reform agenda will be energy economic cost-benefit oriented. The reform process, as she has said herself, will have to start very soon and high ground targets will certainly include capping power prices – not CO2 emissions!